Sentient Developments: Novae produce gamma-rays. Damn. Have no fear! The probability of just the earth being hit by a gamma ray *beam* is very, very, very ... er ... very small. The expanding shell thins out more and more in the distance and diffuses in the interstellar medium. By the way, each nova or super nova, respectively, destroys many of those artificially intelligent, self replicating, killer probes sent out by certain evil alien civilizations, and this could as well be a part solution of the Fermi paradox. Sigh of relief! Perhaps, but what is the likely effective range of the sterilization? If it's just a few light-years, then we only need to worry about Proxima Centauri going nova. And since that's a red dwarf and not a white one, the chance of that seems pretty much nil. "... what is the likely effective range of the sterilization?" Let's make a gross calculation. The amount of power that the Sun deposits on an unprotected area (i.e. without atmosphere) at the distance of the earth at 1 AU (Astronomical Unit) is equal to approximately 1367 W/m/m (Watt per square meter). If a nova emits 1000 times as much as the Sun, this is 1367000 W/m/m. Projected from the surface of a sphere of 1 AU radius to the surface of a sphere of, say, 5 light years radius, we get about 0.0000137 W/m/m. This value is the power per unit area we would get from a typical nova five light years away, additionally to what we get from the Sun. Disappointed? And ... sterilization? 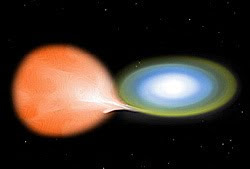 Novae and supernovae create heavier elements and later make it possible that living beings exist on certain planets. This is the opposite of sterilization.